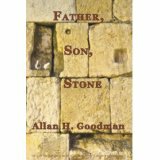 Our new title, FATHER, SON, STONE by Allan H. Goodman, is now available from Amazon.com, Barnes & Noble.com, and all major booksellers. Father, Son, Stone blends history and mystery to reveal the secret of the most controversial religious site in Jerusalem - known to Jews as the Temple Mount and to Muslims as the Noble Sanctuary. In the year 2035, a grandfather and his grandson enter the Dome of the Rock on the Temple Mount. The grandfather, speaking in Arabic, tells his grandson why Jews no longer pray at the Western Wall. The grandfather's story begins in 1967 during the Six-Day War, with three Israeli paratroopers fighting in the battle for Jerusalem. The tale continues fifty years later, in 2017, after a catastrophic event near the Temple Mount brings together the same three men - now the Prime Minister of Israel, a Justice of the Supreme Court of Israel, and a Mossad agent. As the crisis unfolds, the three seek to discover the reason behind mysterious events that occurred on the Temple Mount during the Six-Day War. The truth, when finally revealed, changes Jerusalem, and the people who live there, forever. Our best-selling titles, BASIC SKILLS FOR THE NEW MEDIATOR and BASIC SKILLS FOR THE NEW ARBITRATOR are widely used for self-instruction and as training texts by private trainers and instructors on the undergraduate and graduate level. These books are a must for new practitioners! Experienced mediators and arbitrators will also find many useful suggestions for improving their skills. Written in question and answer format, they answer the one hundred questions most frequently asked by new mediators and arbitrators with clear, concise, and practical "hands-on" instructions. Read the introductions and the hundred questions answered in both books below. Guidance is provided for the non-attorney arbitrator and mediator. Attorneys who represent clients in mediation and arbitration will also benefit from the insight into these processes that these books offer. BASIC SKILLS FOR THE NEW MEDIATOR and BASIC SKILLS FOR THE NEW ARBITRATOR are used by trainers and educators as required and supplemental reading in seminars and university level courses in mediation, arbitration, conflict management, alternative dispute resolution, and related topics. Both books are authored by Allan H. Goodman, an experienced mediator and arbitrator; former adjunct professor of law at Georgetown University Law Center; and Judge on the United States Civilian Board of Contract Appeals. Easy to carry, read and follow. They are exactly what a new mediator/arbitrator needs to learn the ropes and what an experienced mediator/arbitrator needs as a refresher. The Construction Lawyer, Summer, 2002. These books provide a valuable resource to read, keep, and consult on the questions that arise in the day-to-day life of an arbitrator and mediator. . . . They provide a no-nonsense resource which will be valuable to an arbitrator or mediator long after he or she is "new." Online Journal of Peace and Conflict Resolution, May 1999. Basic Skills for the New Mediator, 2nd Edition provides an overview of the entire process, from the mediation conference through all stages of the mediation session. You will learn to establish your authority as the mediator, schedule the mediation session, deliver the mediator's opening statement, prioritize issues, preside during joint sessions and private caucuses, overcome impasses in settlement discussions, identify "hidden agenda" and "throwaway" items, deal with parties who lack authority, and achieve a viable settlement. ISBN 0-9670973-3-9 $25.00 plus shipping and handling. Basic Skills for the New Arbitrator, 2nd Edition begins with a discussion of how and why parties decide to arbitrate, the appointment of the arbitrator, and the arbitrator's duty of disclosure. You will learn to conduct a preliminary conference, issue prehearing orders, establish a discovery schedule, resolve discovery disputes, deal with attempted delays, preside at an arbitration hearing, render the award and avoid prejudicial conduct during the hearing and after the award. ISBN 0-9670973-2-0 $25.00 plus shipping and handling. The private arbitrator will find this easy-to-use book extremely valuable. The detailed table of contents will permit the private arbitrator to use this book even during the hearing when issues arise. NIDR News Volume IV, April-May 1997. Our books are available worldwide, from your bookstore, online booksellers, and directly from the publisher. To place an order directly with Solomon Publications, please call or email for ordering instructions.